When I was a kid, my family didn’t have a lot of money. So, if I had to choose between an article of clothing or a new toy, clothing never made the cut. Even so, there was one article of clothing I always wanted, but never had – a denim jacket (or jean jacket, as they were known back then). In the 80s, it seemed like everyone had a jean jacket. My friends had them. The cool high school kids had them. The young adults walking around town had them. The mechanics, who wore them the best, had them covered in grease and dirt. Man, did I want a jean jacket. And there were all kinds – ripped, patched, some with writing, or just plain old denim. I was particularly drawn to the basic denim look. As I got older and made my own money, I pushed aside my dream of owning a denim jacket. Other priorities grabbed my attention – things like bills, kids’ clothes, vacations, and the many other spending options that define an adult life. It probably sounds silly to a lot of people that after all these years I haven’t bought one for myself. I mean, there are a lot of denim jackets out there that are reasonably priced, and we can afford one, but inside, I’m still that kid that feels like everything costs too much. Plus, I’m a stay-at-home dad (not a high paying position), so I feel guilty every time I want to buy something for myself. This is especially true when I shop for clothes. An internal debate rages every time I pull clothes off the rack and it usually ends with my putting the clothing back. It is no longer the 80s, but denim jackets are back in style and can be found at almost every clothing store. My silly dream of owning a denim jacket has never left and every time I happen to pass by a display, my desire for the jacket returns. So you can imagine how I felt when I walked into denim heaven at the last Dad 2.0 conference in New Orleans. 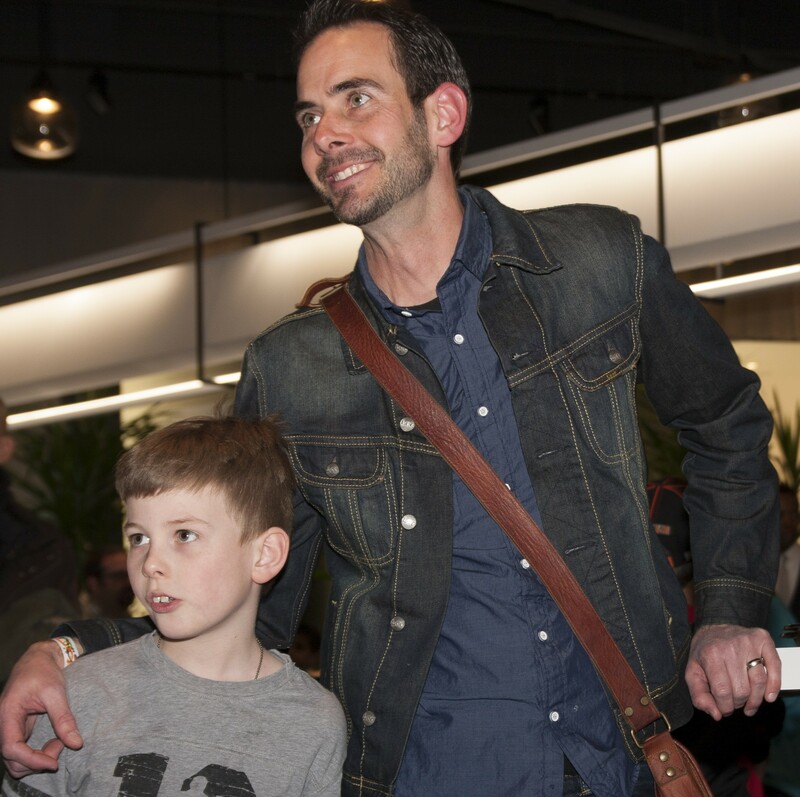 One of the sponsors of the conference was Lee Jeans and they had set up a room for all the dads (and some moms) to try on jeans to find that perfect comfort fit. Something else besides jeans in that room caught my eye, though. As I walked into the room, my head whipped around to a line of denim jackets hanging up in a neat row. After trying on some jeans and graciously accepting a free pair, I wandered over to the jackets and took one off the hanger. I hesitated. It seemed too good to be true that I would be offered one, so I hung it back up. As I tried to walk away from the jackets, though, I could feel a denim gravitational pull rooting me to the spot. Turning around, I stopped for one last look. It seemed like I was that little kid again, aching for something I would never have. Thankfully, I caught the eye of the very friendly folks at Lee. They walked me through the perfect fit, as I tried on the jackets. Each jacket I tried on felt perfect to me – perfectly glorious. Since I had already had a conversation with them about how I prefer tighter clothes, they placed a nicely fitted jacket around my shoulders. My childhood enveloped me just as the sleeves hugged my arms and wrists. Looking into the mirror, I was happy with what I saw. 30 years later, my denim journey had come to an end. *The jacket was given to me without an obligation to write a review. I did not receive any compensation from Lee for writing this post. The jacket was given freely and the thoughts are my own. I got one, too! I think I’m going to wear it tomorrow night for an outdoor concert with Willie Nelson, as one should do. I can’t think of a better place to wear one. I actually wear mine to bed. Can’t wait to see the jacket in person. Chances are you will. I wear it all the time and I must say it looks quite good on me. Not many can pull off the denim jacket, Jason, but by golly you look dashing in it. Next Entry Is the new Godzilla movie appropriate for kids?